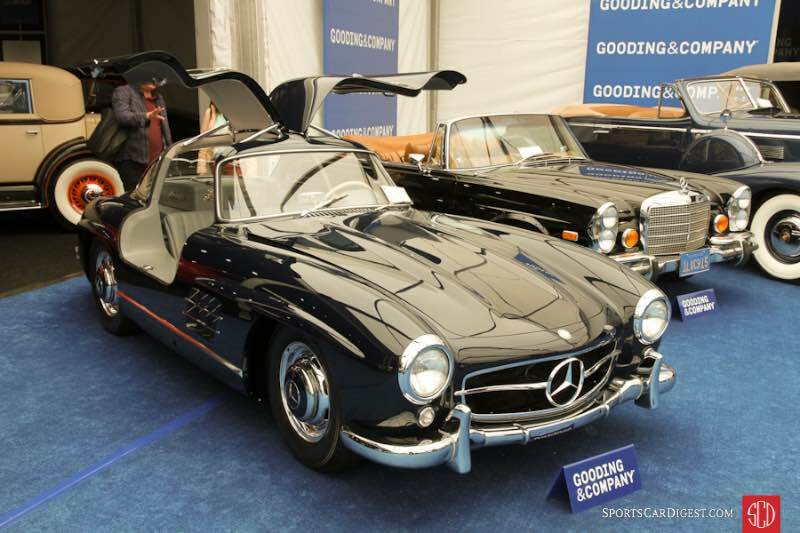 Lot # 14 1955 Mercedes-Benz 300SL Gullwing; S/N 1980405500654; Engine # 1989805500701; Midnight Blue/Gray leather; Estimate $1,400,000 – $1,600,000; Older restoration, 2 condition; Hammered Sold at $1,300,000 plus commission of 10.00%; Final Price $1,430,000. With Reserve. – Hubcaps, chrome wheels, Avon tires, fitted luggage, VDO dash clock, belly pans, tools. – Very good interior. Very good older paint. Very good restored underneath. Excellent chrome. Done to high standards by Hjeltness Restoration in California in the early 1990s. 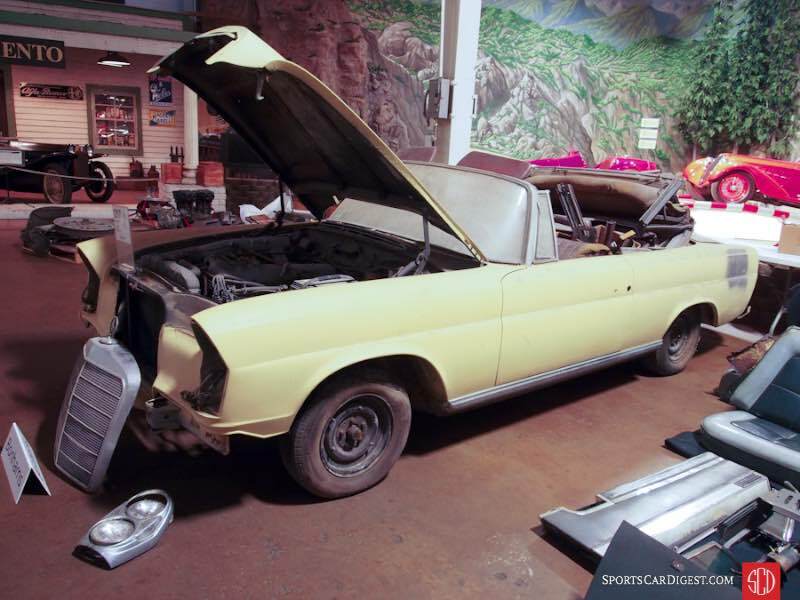 The car was seized by the Justice Department in the middle of restoration when the owner was arrested, but the restoration was finished and it passed through several sympathetic collectors and is still in like new condition. – Sold here in 2012 for $1,025,000, a car so good at the time that its nearly two decade old restoration was described as ‘Recent’. It’s still that good with the odometer showing only 130 more miles now than it did then. An outstanding automobile bought for an appropriate price. 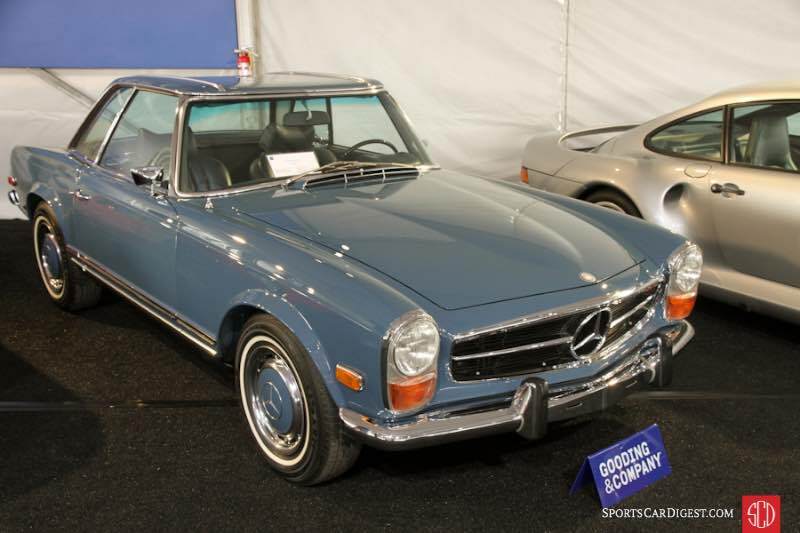 Lot # 20 1971 Mercedes-Benz 280SL Convertible; S/N 11304412022135; Blue, , Blue hardtop/Blue; Estimate $250,000 – $275,000; Visually maintained, largely original, 2 condition; Hammered Sold at $190,000 plus commission of 10.00%; Final Price $209,000. With Reserve. – Automatic, wheel covers, Kumho narrow whitewalls, pagoda roof hardtop and soft top, Becker Europa radio, VDO dash clock, Frigiking air conditioning, kinder seat. – Windshield is delaminating at the bottom. Superb original paint and chrome. A few chips on the fender lips. Very light pitting on the hardtop frames. Interior is superb as well. Original underneath. Given a new top, tires, exhaust and suspension bushings among other things during a major service in 2012, but almost completely original. This looks like a car that’s six months old. – With all the rare, exotic significant automobiles to look at under the Gooding tents and gleaming catalogue pages, it would have been easy to miss this relatively common 280SL. The unbelievable level of originality, though, caught the right people’s attention. While the result was very expensive, the opportunity to find one this good and this original probably won’t come up again any time soon. 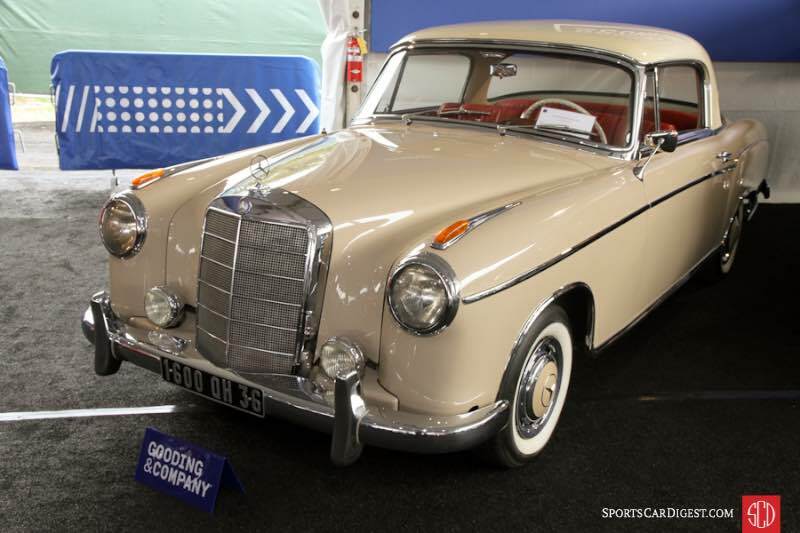 Lot # 67 1957 Mercedes-Benz 220S Coupe; S/N 180037N7509637; Beige, , Cream roof/Red leather; Estimate $100,000 – $130,000; Visually maintained, largely original, 3 condition; Hammered Sold at $50,000 plus commission of 10.00%; Final Price $55,000. No Reserve. – Wheel covers, Silvertown whitewalls, Bosch driving lights, dash clock, column shift 4-speed, Becker Brescia radio. – Single owner for over 30 years. Very good chrome. Dry, cracking windshield gasket. Light pitting on the rear bumper. 1992 repaint in very good condition. Worn but sound original upholstery. Fantastic wood that’s likely been refinished. Scratches from the wipers on the windshield. Some paint flaking off the steel wheels. Very clean and original underneath, other than a replacement engine block fitted in 2009 along with a later cylinder head. An odd mix of restored and original condition. Represented as having been first purchased in 1957 for the then-Prince of Spain Juan Carlos, but no further history is advertised. – This is a nice enough 220S that has been maintained by only a few owners as a driver quality vehicle to whom the block and later head probably seemed like a worthwhile improvement in performance. It doesn’t have that effect upon later collectors, however, and even the price here at half the pre-sale low estimate is ample, if not generous. Lot # 153 1960 Mercedes-Benz 300SL Roadster; S/N 19804210002507; Engine # 19898010002560; White/Dark Blue leather; Dark Blue cloth top; Estimate $1,100,000 – $1,300,000; Older restoration, 3+ condition; Hammered Sold at $1,125,000 plus commission of 10.00%; Final Price $1,237,500. With Reserve. – Hub caps, Michelin Harmony tires, Talbot Berlin mirror, VDO dash clock, Becker Mexico stereo. – Small crack in the Talbot Berlin badge on the mirror. Small scrape in the front bumper and light pitting on it as well. Wheels could stand a good cleaning. Rear rocker trim isn’t flush. A few small dents in the right front hub cap. Light scratches on the left rocker trim. Big chip on the left front edge of the hood. Another on the front edge of the passenger’s side door. Very good lightly worn older seats and restored interior. Good top. Restoration by Scott Grundfor Company in original colors done 10 years and 500 miles ago, but the age is starting to show and this isn’t much more than a driver SL Roadster. 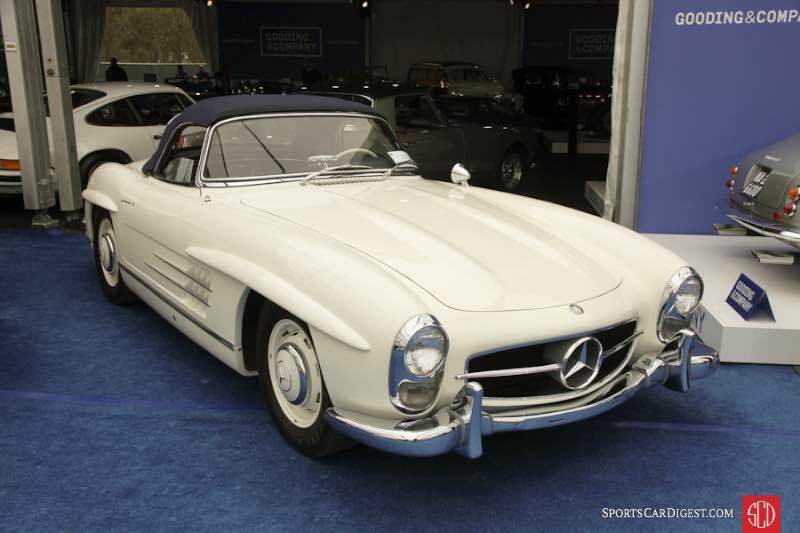 – Two years ago, this car probably could have commanded a lot closer to $1.5 million, but after 300SL prices have settled this is a spot on result. 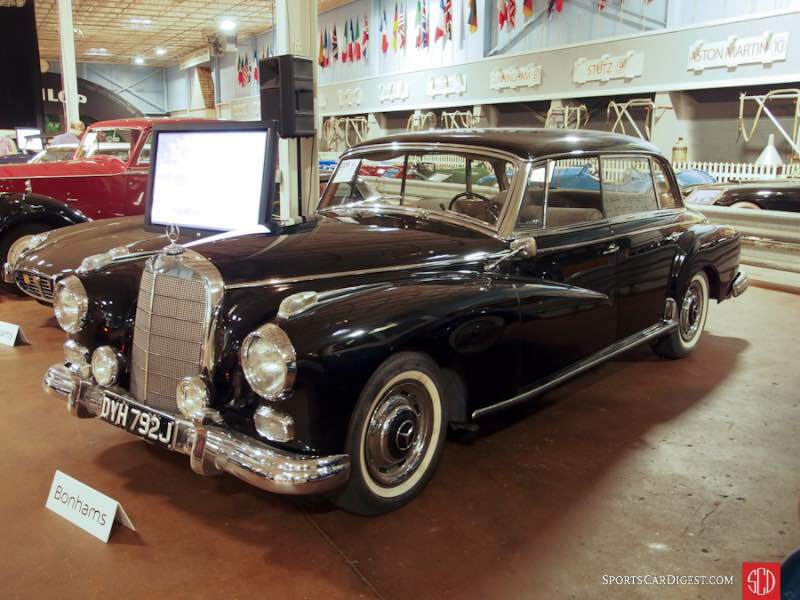 Lot # 209 1959 Mercedes-Benz 300d 4-Dr. Sedan; S/N 189010120011696; Engine # 189980129500313; Black/Grey cloth; Estimate $50,000 – $70,000; Visually maintained, largely original, 3 condition; Hammered Sold at $35,000 plus commission of 10.00%; Final Price $38,500. With Reserve. – Automatic, Blaupunkt multi-band radio, wheel covers, aftermarket air conditioning, Cibie driving lights, whitewalls, power windows. – Fair repaint over old paint. Good chrome and interior. Clean gauges with weak bezel chrome. Original undercoat in wheelwells. Good interior wood trim. Believed to be two owners from new and in condition appropriate to the 79,571 miles on its odometer. – A very satisfying car that suggests it is nothing more, or less, than it appears to be and is the pinnacle of luxury from its era. It isn’t sleek, it isn’t svelte, it doesn’t have a swarm of questionable power accessories; it’s just visual class stratification, both then and now, and is a highly reasonable acquisition at this price. Lot # 217 1965 Mercedes-Benz 220 SE Cabriolet; S/N 1110231000089; Primer/Red vinyl; Beige cloth top; Estimate $18,000 – $24,000; Incomplete restoration, 5 condition; Hammered Sold at $28,000 plus commission of 10.00%; Final Price $30,800. No Reserve. – 4-speed, Becker Europa AM-FM, – Dusty, dirty, rusty. Tattered upholstery. Filled door bottoms. Boxes of unsorted parts. Engine hasn’t been out or had anything done. Needs everything is an understatement. – Touted as a one owner car, a qualification that means little in this condition, especially with the visibly wavy filled door bottoms. It was a cosmetic restoration gone bad, real bad, and it will be an expensive challenge to make anything out of it, especially at this price going in. 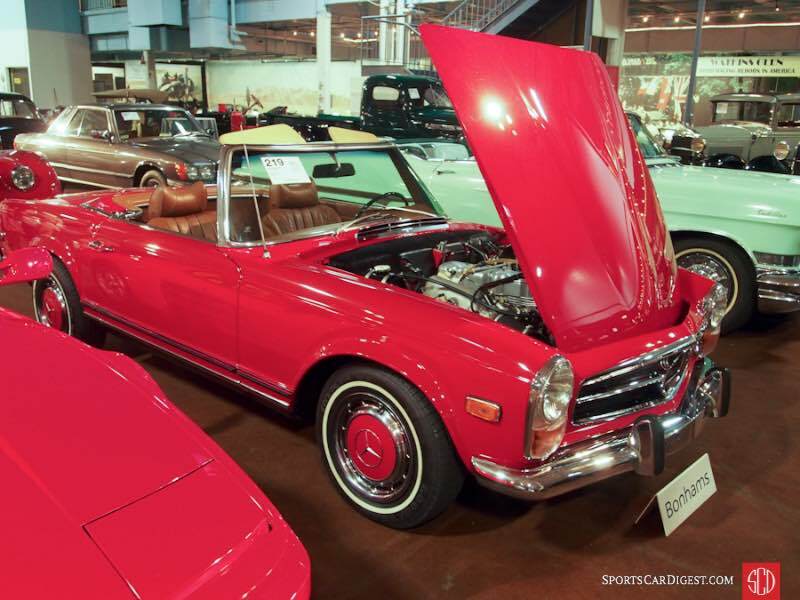 Lot # 219 1970 Mercedes-Benz 280SL Roadster; S/N 11304410014571; Red/Saddle Brown vinyl; Black cloth top; Estimate $75,000 – $100,000; Older restoration, 2- condition; Not sold at Hammer bid of $0 plus commission of; Final Price. With Reserve. – Blaupunkt AM-FM, 4-speed, headrest seats, wheel covers, narrow whitewalls. – Restored like new with some subsequent use and age. Very good paint and chrome. One rip in the driver’s seatback, otherwise the upholstery is sound and likely original. Underbody has been done to showroom condition with little evident subsequent use.